I am not a security expert! Can potentially affect any site using a SQL database (LAMP, WAMP, ...)! XQuery injection is hardly ever mentioned. Does that mean that XQuery is "injection safe"? http://localhost:8080/orbeon/exist/rest/db/app/users/?_query=//user[mail=%27" + username + "%27]"
Of course, the eXist-db HTTP client module can do much better! Do not store non encrypted passwords. Do not enable extensions modules unless you really need them. What about forbidding simple quotes as a protection? ... and give Tim O'Reilly a reason to rant about yet another dumb site! ... or use them as string literals and cast them in XPath/XQuery. If you use request parameters you must cast them anyway. Exposed to string literal injection through its XPath expressions. Things are worse if the implementation supports XPath 2.0, XQuery update facilities and extension functions. saxon:evaluate(), util:eval() and friends are injection prone. When used inside a query, you may need to sanitize twice! Variables defined out of the call play the same role as query parameters for XQuery injection. When used inside a query, query parameters are safe inside the call. What about XProc, XPL, Schematron, W3C XML Schema 1.1, XPointer, ... ? 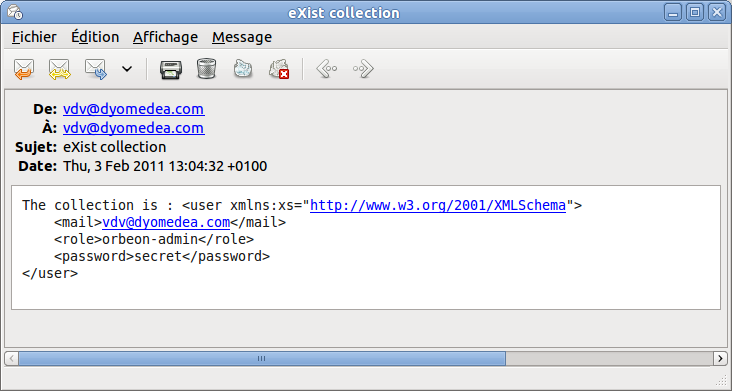 ... iff user input is copied into XPath expressions. Seems less likely for these ones, but who knows? Maybe a subject for XML Prague 2012!